A murder investigation. All in a day’s work for Sherlock Holmes. British Army doctor John Watson (Martin Freeman) has returned to England from service in Afghanistan, but has no place to stay. He then gets directed to Sherlock Holmes (Benedict Cumberbatch). Little does he know that he is about to move in with a professional consulting detective. Sherlock is a BBC serial that is a modern reinterpretation of Sir Arthur Conan Doyle’s literary detective and had started up in 2010, and I had gotten through this first series just in time for the start of season 2. If you may remember, I had seen Sherlock Holmes: A Game of Shadows (2011), featuring Robert Downey Jr. as the titular detective, back in January, which followed up Sherlock Holmes (2009). As I had mentioned in my review of A Game of Shadows, the movies more or less constructed original characters and named them after Sir Arthur Conan Doyle’s. I think it is safe to say that Sherlock is actually a more faithful interpretation, despite the modern setting. I’m not really one for televised dramas in general, but I will say Sherlock is definitely one of the more tightly-written ones I have ever seen. Season 1 was only three episodes long, each with a length of about ninety minutes. Despite the shear length of each episode, I can truthfully say I was never bored due to their great pacing. When you take a step back and look at the surface of the show, Sherlock also easily one of the most stylish shows I have ever seen. 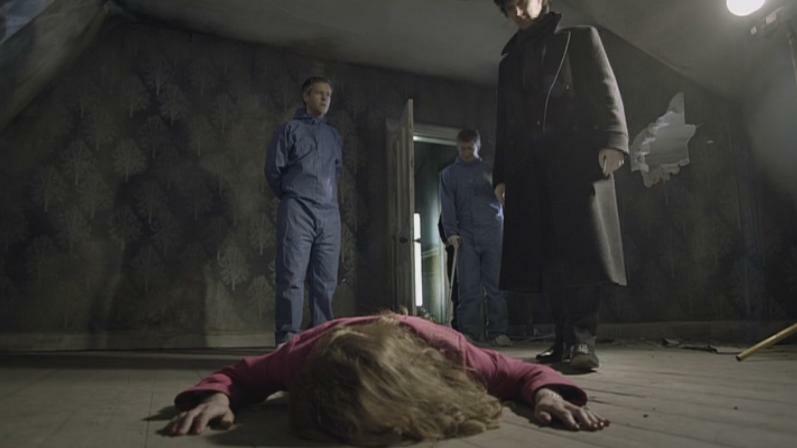 When Sherlock investigates a crime scene, text would be shown in order to let the viewer in on what he was thinking. Text visually showing people’s thoughts can be hit-or-miss, but I thought it worked extremely well on the show and actually functioned as a terrific substitute for expository dialogue. In general, it is quite clear that Sherlock was made on a very high budget, which is probably why season 1 was only three episodes long and why fans had to wait two years for the second season. The exterior shots were filmed on-location in London, which lent itself to a terrific atmosphere all around. Of course, there was a little bit of CG, but nowhere near as much as the Guy Ritchie films. Benedict Cumberbatch, who starred in films like Starter for 10 (2007) and Atonement (2007), gave a unique take on the Sherlock Holmes character. What is considered by many to be the definitive depiction of the character is when Jeremy Brett took on the role in the 1984-1994 television series, which was directly based on the Arthur Conan Doyle series. Brett could often be theatrical, but I think he was about as close as anyone ever got (at least up until then) to being what the author had in mind. And then you have Robert Downey Jr., who essentially made Sherlock Holmes into more of a comedy/action hero. Cumberbatch didn’t really seem to follow either and gave a generally very subtle performance. I will say Martin Freeman is the best Watson I have seen so far. The Sherlock Holmes stories were all narrated from Watson’s point of view, and Sherlock had it shown as Watson maintaining a blog about his exploits with Holmes. I felt he had more personality as Watson than either David Burke or Edward Hardwicke but at the same time wasn’t as in my face as Jude Law. While Sherlock had great style, it also had the substance that was sorely lacking in the Guy Ritchie films. Despite being quite familiar with the Sherlock Holmes character, having read many of the original stories, I would say that character development came at a terrific pace. As far as the actual crime and investigation in the show, I will say Sherlock has done what no other crime and investigation show has: It made me feel smart when I was watching it. I would have been completely unable to spot what connections Sherlock was making, but they would always make sense to me when Sherlock would summarize what led him to his conclusions. On the other hand, you have the short-lived series Lie to Me, where even I could spot what Dr. Lightman was looking at from a mile away. As a fan of the literary detective, I will be honest and say that the 1984-1994 series is still the definitive Sherlock Holmes. However, I would say that Sherlock is a worthy successor in its reinterpretation of the character and am quite excited for the second season. Just finished up series 2 of Sherlock…Benedict Cumberbatch rules! I haven’t gotten a chance to see season 2 yet. Season 1 was all up on Netflix, but season 2 isn’t up there yet. As soon as it is there, I’ll watch it then. Yeah I watched season 1 on Netflix as well. Thankfully I caught season 2 when it premiered on PBS here…it should hit Netflix in the next month or so. Ah, I haven’t seen that one! There’s so many television series/mini-series that I need to get to lol. I was so sceptical when I heard about this series and i sat down with a negative mindset to watch the first episode, and of course I was blown away by it. Have you seen the deleted first episode of the first season? It’s absolutely amazing to me how much they improved the first episode, which I think basically set the tone for later episodes. I have not seen it, but I am excitedly waiting for season 2 to go up on Netflix! I have heard the original pilot bore little resemblance to the show as we now know.